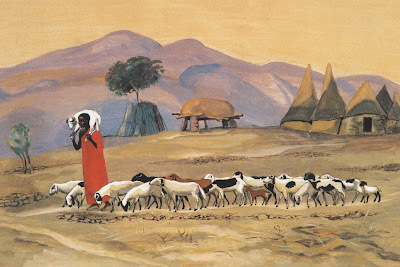 The good shepherd, from Art in the Christian Tradition, a project of the Vanderbilt Divinity Library, Nashville, TN. http://diglib.library.vanderbilt.edu/act-imagelink.pl?RC=48288 [retrieved April 27, 2009]. Today we’re talking about presence. Presence is powerful. Many experiences in life—those that are good or positive—are made more powerful, more meaningful by the presence of others. Some events—those that are sad or difficult or challenging—can be more bearable by the presence of someone else. For me, the presence of my children is a powerful force. Sometimes the most spiritually and emotionally powerful moments with my children are when they sleep; and we’re not doing anything—I’m simply being present with them. I put my hand on B's back and feel his breathing, or I look at C's face--his pouty lips and puffy cheeks. I stroke A's hair and stare at her beautiful face…They impact me deeply, simply by their presence. An example of presence in a difficult time happened five years ago, when my father died. On the day of the funeral, I was at the funeral home, greeting people, feeling heavy, preparing myself for the talk I was going to give in the service. A car I didn’t recognize parked, the door opened, and a man got out. When he turned and walked toward me, I saw that it was my friend Dale. Dale is my oldest friend; we've been friends for 35 years. We were best friends through high school. We were in each other’s weddings. Although we’ve both moved several places around the country, we have stayed connected through the years. At the time of the funeral, Dale lived in Texas. On just a few days notice, after hearing of my father’s death, Dale took off work, said goodbye to his family, and got on a plane to Virginia, just to be present with me as I grieved my father’s death. He didn’t have to do or say anything. By just being there, by being present, Dale blessed me incredibly. John starts this first letter of his recorded in the Bible by talking about Jesus’ presence. John reminds his original listeners or readers, and he reminds us, that Jesus was real. He had a physical presence. His followers experienced His presence. We talked earlier about how powerful the presence of other people can be--this passage reminds us that even though it is different, Jesus is present with us, in a way that is very real. We worship a God who is a spirit, but also became a man. I think that Jesus’ presence with us is more real and powerful and intimate than we usually realize. I am the bread that gives life. Whoever comes to me will never be hungry, and whoever believes in me will never be thirsty. The Father gives me the people who are mine. Every one of them will come to me, and I will always accept them. I am the good shepherd. I know my sheep, and my sheep know me. I am the way, and the truth, and the life. The only way to the Father is through me. If you know me, then you know and see God. Come to me, all of you who are tired and have heavy loads, and I will give you rest. I will be with you always, even until the end of this age. While today we have focused on Jesus’ presence with us as individuals, we also see that John is also emphasizing how Jesus’ presence is also a community thing. John 17--Father, I pray that they can be one. As you are in me and I am in you, I pray that they can also be one in us. John says that the relationships we have with each other, the blessing that comes when we are present with each other, is made even more special, more spiritual, more powerful, more alive--because Jesus is present with us. Today, I am thankful for Jesus’ presence, and for yours.